We have been asked about the traffic of horses to slaughter between the UK and Mainland Europe, so I have drafted this to try and help raise awareness of how the trading of horses destined for the dinner plate works. At ERF, we are fully aware that despite public statements to the contrary from various official bodies, horses are still exported live from the UK to France. There are many myths put about to try and deflect from this, so this blog is to try and dispel them. 1. There is a minimum value in place to make it illegal to export animals under meat value. There was a minimum value, however, as no checks are made at the ports, it is not policed. And it only applies to ponies, not horses. 2. It’s not worth exporting horses and ponies for meat. In the UK are horses that nobody wants, for many reasons. Too old, lame, behavioural problems, loss of form (racing, dressage, eventing, endurance, even just happy hackers). If the current owner no longer wants the horse, does not want to retire or responsibly euthanase the horse at home, getting rid of them, or recouping some money from them is difficult. These horses are impossible to sell genuinely, so are habitually passed on to dealers to sell on as part exchange where they frequently have their passport redone to hide their identity, or are doped up to sell; either to mask pain, or with a calmer to make them rideable. Those that don’t sell in that manner are then sent through a sale ring with no reserve, or to the dealers that send to slaughter. Unwanted horses end up in a downward spiral where they can be sold for as little as £100 or even less, with ponies selling for a few pounds at a downmarket unmonitored sale, so at that price are still a financially viable proposition to send to slaughter. On the continent, as in the UK, are horses that nobody wants, for many reasons. If not responsibly euthanased at home, these are normally sent to dealers who take them to the abattoirs. This is where international trade fails horses. Dealers from the UK and France/Belgium/Holland etc all interact with each other. Dealers are traders – the most money for the least effort is their aim. They are often also registered International transporters. It’s common practice amongst dealers to buy ‘job lots’. Horses are only another commodity to them, so they are traded no differently to other commodities. And buying in bulk always brings reductions in price. Here is a link to the Dartmoors we found a major meat sale in France. So as a hypothetical (but likely) example – British Dealer (Brit) has 10 horses that cost him about £1,000 in the UK. He doesn’t bother feeding them, he just keeps them until he has a lorry load. He ships them across to France, and leaves them with a European Dealer (Euro) there. When there, he buys/swaps them for horses that Euro, or a business aquaintance of his, has. As long as the weight per load is equivalent, Euro doesn’t really care about the types, because his interest is the numbers of kilos, but he’ll probably still make a bit of money on top of it for doing nothing but swapping horses over. Brit then goes back to the UK with 10 horses, often with great European bloodlines, that were in the abattoir queues for the reasons the Brit horses were. However well bred the horse is, if it’s unrideable it shouldn’t have a resale value. But Brit (depending on his reputation) has no qualms about doping a 400€ horse to sell it for between £3,000 and £10,000. Without x-rays and blood tests, it’s impossible for a vet to know whether or not a horse is full of bute and what problems exist under the skin. Very few people thinking they have found their bargain dream horse will even consider how they are being duped. Tendon injuries can be constricted with a blister, deep soft tissues injuries and low grade arthritic conditions can be masked by painkillers. So for each horse he has cherry picked fron Euro’s holding yard, for looks, movement, pedigree etc, he can make a significant profit, with several horses, even with perhaps a couple of them still being impossible to sell. And those will either go to a UK abbatoir, or end up sold within a job lot to another dealer. And so it repeats. Dealers can import foreign horses because nobody in the UK will recognise them or trace their chip numbers, and be able to inform the new owner of the real history, unlike the UK. As the exported horses are going to the abattoir in Italy, their history doesn’t matter. A good horse has the same value as an injured one. This horse is a typical example. We found him, but even then he was used by us to highlight the trading. Luckily, he has a future because of our using him. The biggest problem faced by those of us wanting to prevent this trade in live horses for meat, is that it all done on the quiet, because the UK doesn’t acknowledge the horse as a meat animal, so there is no traceability whatsoever in those shipped abroad. 3. Slaughterhouses in the UK. Currently there are only three publicly licensed to slaughter horses for meat. Potters in the SW, and Turners who have one in Cheshire and the other in the SE. The UK slaughters approximately 20,000 head of horses each year, roughly the same as France. Horses are being shipped from the UK to France because the abattoirs are too busy. On welfare grounds, it would be better for the horse who is destined to meet that fate if there were more abattoirs licensed for horses in the UK. At least then the more stringent regulations generally applied in British abattoirs would make the final journey for these horses a shorter and more humane one. One of the biggest issues limiting export for slaughter is the TPA. It is gone into fully on this link to our site. Please read it and see just how difficult it is to stop the dealers importing and exporting legitimately under such an agreement. This is the actual agreement. And this is the ERF suggestion as to why changes are vital, and how it could be policed more effectively. 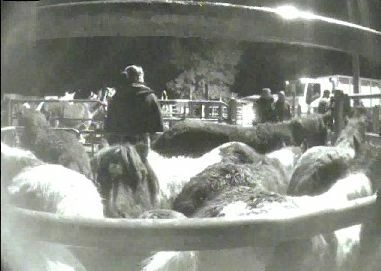 A petition has been set up to help prevent malpractice in the live export of all animals to slaughter, and can be found here. Please sign, as all awareness raised is important. If conditions improve for some species, then there is a knock on effect onto others. There needs to be a change in the law whereby animals are not classed as trade, and the journey times to slaughter are vastly diminished. Each small step forward will bring us nearer to more humane treatment for all animals. please stay aware of this! My friend just tried to buy an Icelandic Horse, the story was it came over from France to the UK on a consignment of horses destined for the meat trade. The horse was in Essex. Since when did the French import horses here for slaughter? As we say in the article, horses are shipped backwards and forwards across the channel regularly. We’d be interested to pursue the story of this horse, perhaps you could email us more information to admin@equinerescuefrance.org ? Thanks. This is interesting & might explain why my recently rescued Westfalen mare, who I bought for £200 from a dealer, ended up in this country with no passport and a microchip implanted in Holland five years ago. 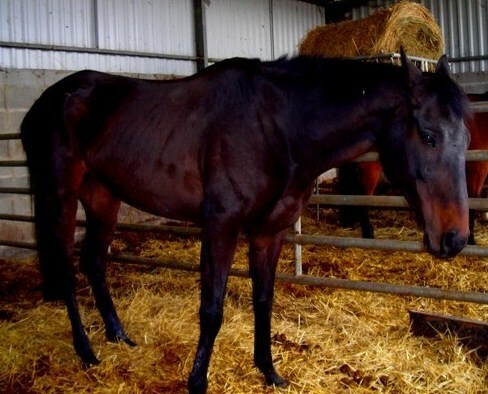 She was emaciated, not in foal as the dealer said, and several years older than stated in the ad. I imagine she was part of this process – she is branded. She’s got a home with me for the rest of her life. God help these poor creatures. Well done for looking after her.